Suzuki, specialist in building a compact crossover decades before it was a trendy market segment, has hit the Geneva show with the iM-4 Concept. The company is calling it a “mini 4x4” that’s “rooted in the Suzuki 4x4 tradition,” hinting that this as a Jimny replacement. The iM-4 eschews the current compact crossover ‘lifestyle’ narrative and instead is pitched as a simple, rugged, honest little off-roader – albeit one that uses a modern mild hybrid system in which lithium ion batteries accompany the motor to lower fuel consumption. A proper 4x4 with mud-conquering credentials, the iM-4 is about the size of a Nissan Juke and has a design that’s distinctly retro, with a boxy vibe redolent of Suzuki’s output in the 1970s and ‘80s. But no soft top, sadly. The grille is inspired by sunglasses, says Suzuki, while the flared arches give it a wider stance than the average Japanese kei car. 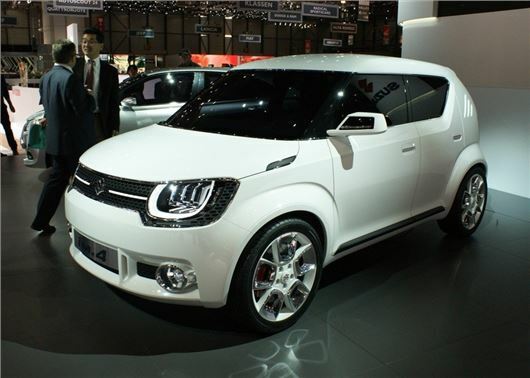 A four-seater, Suzuki hasn’t given away any details on cabin space, nor its fuel efficiency figures. We do know that a 1.2-litre Dualjet petrol engine is under the bonnet though, and that the lithium ion batteries are recharged via regenerative braking. No word on what this concept will eventually lead to, but don’t be surprised if it does indeed form the basis of a new Jimny in 2016. To me it looks more like an SX4 replacement, fitting in between the Jimny and S-Cross. EDIT: Thinking about it, the Ignis they discontinued a few years ago was almost exactly the same car as this.